Fryguy's yearbook from his days in Fryguy High. Fryguy High is a high school attended by Fryguys which was mentioned the one-page comic, "Fryguy High Yearbook -- Activity Page!" by Valiant's Nintendo Comics System imprint. Though not much is revealed about Fryguy High, it is mentioned to have a baseball team and presumably other sports teams as well. Field trips were also shown to be taken in Fryguy High, though these were likely canceled when a field trip by Fryguys to the "Kaboomka Fireworks Factory" caused its explosion. The last panel of "Fryguy High Yearbook -- Activity Page!" seems to imply that Fryguy High had, unsurprisingly, burned down and that all that was left of it were some charred timbers. Fryguy High was apparently going to be rebuilt at one time, though these reconstruction plans were put-off indefinably. 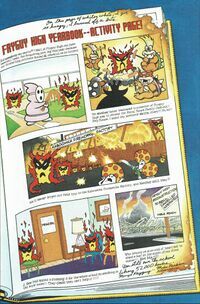 Another school for Fryguys, called Fryguy Kindergarten, is also mentioned in Nintendo Comics System, more specifically, in "Duh Stoopid Bomb!". This page was last edited on August 12, 2018, at 22:50.